We are at an inflection point, for the first time in our history every single person has a voice. We created a proxy for the voice of every individual through Democracy, rule of law and the voting system, but they are not perfect. Democracy is not perfect, it gives way for many externalities, interest group lobbies, corruption etc but it is the best of the worst we have. I believe with the advent of the internet and mobile devices or internet connected devices, we can really influence how our proxies are used here I mean our opinion. There is an experiment on-going in Iceland, the financial collapse in 2008 has created fantastic opportunities and many ideas have been launched. One of those related to Pubic Service and Governance of Public office. 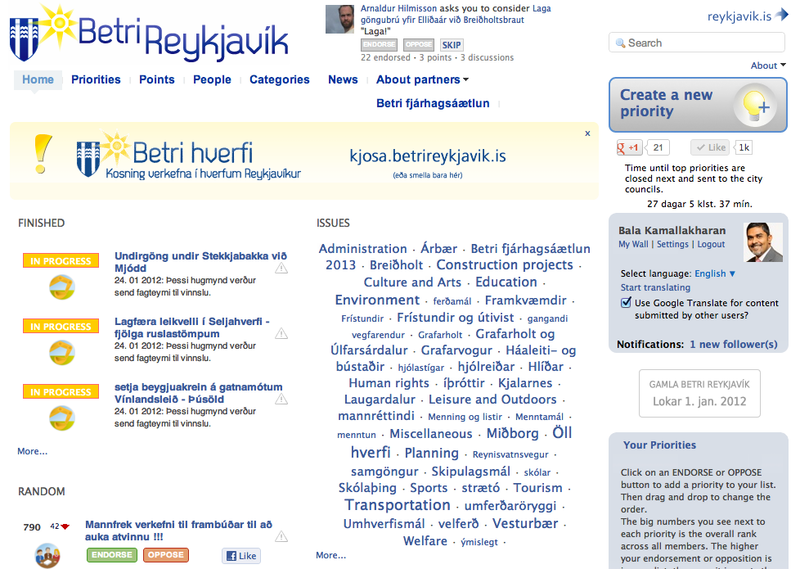 I got notice of Betri Reykjavik, when I was invited to give a small talk by the Web Masters Association of Iceland. The website has been created to get all residents of the City of Reykjavik to participate in governance issues related to the city. Starting with voting on a proposal for a swimming pool in your neighborhood or allocating capital to fund a child care center. It is fascinating to notice how governance can truly reflect “For the People, By the People and Of the People” with the use of the modern technologies. So I did a little bit of digging around and found out about Citizens.is a non-profit organization that wants to expand this model to other cities and countries around the world. I think it is an incredible idea, but you need public commitment to make initiatives like this to work. One thing that is clear is having the entire nation on Facebook helps, it helps to validate whether the right person is voting or not. But it is painfully obvious when you look at the numbers there are only 1000 likes for Betri Reykjavik. 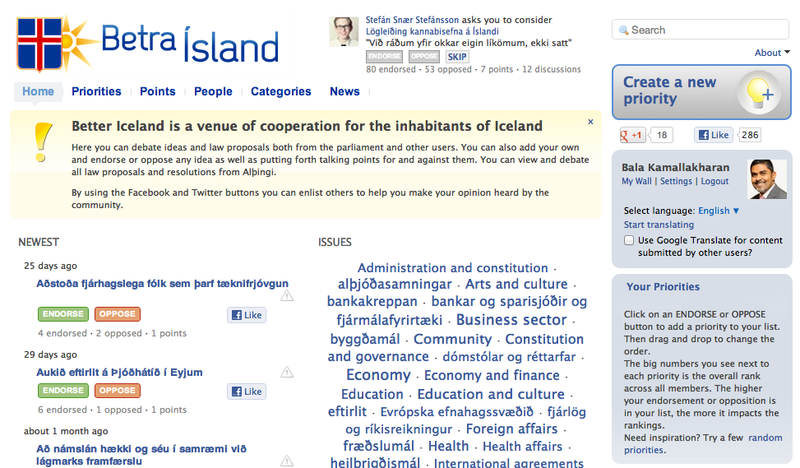 Should’nt all residents of Reykjavik participate? I think this is the next frontier for the Internet. We have solved the trust issue i.e we trust buying things on the internet, can we start trusting the internet for other things? like voting? The people behind the Betri Reykjavik have now launched Betra Island which literally translates to Better Iceland, you do not get points for guessing what Betri Reykjavik stands for. I will meet with the team behind this concept and learn more about it. I think there is big opportunity to build platforms like this. If you have been complaining about things that the Government is not doing in your neighborhood and you happen to live in Reykjavik, go ahead, sign up with BetriReykjavik.is or BetraIsland.is create your priorities and start canvasing votes to make it into the Parliament of the city of Reykjavik or Iceland. Now, we don’t have an excuse to blame our problems on the Government 🙂 I don’t know if I feel good or bad about this.